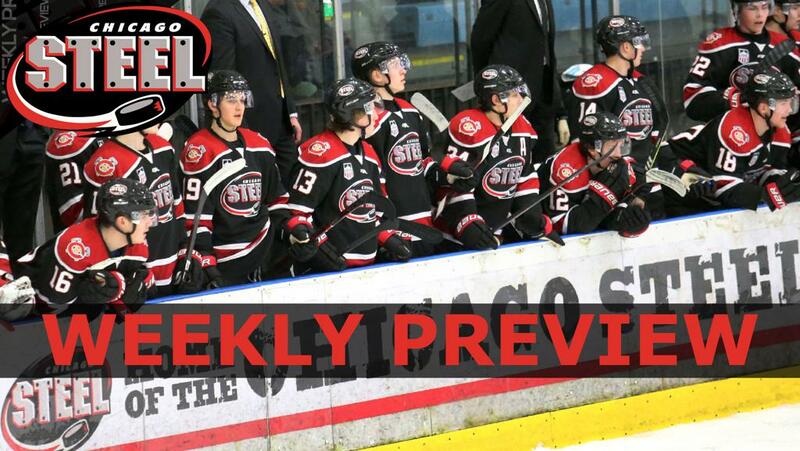 GENEVA, ILLINOIS — The Chicago Steel are set to close the regular season with a pair of games this weekend, including Friday night’s Fan Appreciation Night at Fox Valley Ice Arena during a 7:05 p.m. meeting with the Central Illinois Flying Aces. Chicago then travels to Muskegon to take on the Eastern Conference-leading Muskegon Lumberjacks on Saturday at 6:15 p.m. CT. The Steel are set to give away hundreds of prizes for Fan Appreciation Night ranging from unique Steel experiences, gift cards and other awards for Steel goals, and numerous gifts from Steel partners. Fans can win the chance to play ping pong with forward Nick Abruzzese, play bubble hockey against Head Coach Greg Moore, take a selfie with forward Robert Mastrosimone, execute a “really good” high five with forward Adam Robbins, meet the first star of the game and even take your own team photo with the Steel after the game. Prizes from Steel partners include concert tickets to see Smashing Pumpkins, Sammy Hagar, and Alice Cooper from 95.9 The River, free golf from TopGolf Naperville, a two-night stay at Comfort Inn & Suites Geneva, a free trial class at School of Art Geneva, “Your Height in Bud Light,” cooler, and Huntington Grill all from Superior Beverage, Buddy and Family Day passes from Vertical Endeavors, custom bleaching trays from Geneva Family Dental, spirit wear from Waubonsee Community College, gift cards and much more. In addition, each fan will be handed a photo of a Steel player when they enter the Arena. If that player scores, fans will win prizes from Raising Cane’s in Naperville, On The Border in St. Charles and more. Tickets for Fan Appreciation Night are on sale now starting at just $10 and stadium seating on the glass is available for just $20. Parking is always free. Chicago (35-21-4-0, 74 pts.) continues to find itself in the middle of a tightly-contested race for the #2 seed and a First Round bye in the Clark Cup Playoffs. The Steel currently hold the second spot with 74 points, but the Youngstown Phantoms and Cedar Rapids RoughRiders each have 73 points with two games remaining in the regular season. Playoff tickets are on sale now with a special ticket promotion to benefit Special Olympics Illinois. 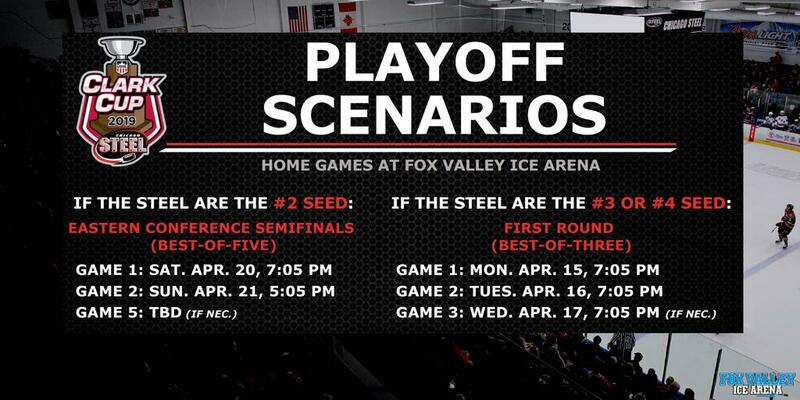 For the first two playoff home games, the Steel are offering a special “Buy One, Get One, Give One” offer for tickets purchased through April 14. Any fan who purchases a White ($15) or Red ($10) Zone ticket for either of the team’s first two home games will receive a free ticket of equal value for the same game. In addition, the Steel will give a ticket to Special Olympics Illinois for a game next season. Fans can take advantage of the special offer by calling 855-51-STEEL or visiting the team’s website, ChicagoSteelHockeyTeam.com and entering promo code “Playoffs” when purchasing tickets. Friday night will be the seventh and final meeting of the season between Chicago and Central Illinois (24-31-3-2, 53 pts.) as the Steel will attempt to build on a 4-2-0-0 record against the Flying Aces this season, including 2-0-0-0 at Fox Valley Ice Arena. Chicago won the first three matchups before Central Illinois answered back with two-straight wins, but Steel goaltender Justin Robbins recorded a 30-save shutout in the last matchup as Chicago won 2-0 on January 18. Abruzzese (27-49-76), the USHL’s leading scorer, will look to continue his pace against the Flying Aces as he already has 10 points (4-6-10) in six games. Steel forward Neil Shea has appeared in five games and has amassed seven points (2-5-7) against Central Illinois. Forward Adam Robbins has recorded a point in all six games in which he has appeared (2-4-6). Scoring against Central Illinois has been spread out this season as 20 different Chicago skaters have recorded at least one point against the Flying Aces. Central Illinois has had two players score in four different games against Chicago this season including forward Trevor Janicke (2-4-6) and defenseman Ryan Siedem (0-5-5). Janicke and forward Philippe Lapointe (3-3-6) are tied for the team lead with six points while Lapointe and forward Cal Kiefiuk (3-2-5) have each recorded three-point games. Janicke currently leads the Flying Aces with 47 points (21-26-47) in 56 games this season. The goaltenders tasked with stopping the scoring include Justin Robbins and Reilly Herbst for Chicago and Mitchell Gibson and Ryan Snowden for Central Illinois. Robbins has a 3-1-0-0 record against the Flying Aces this season with a 2.76 goals against average while Herbst has split his two appearances. For Central Illinois, Gibson has the better record (2-2-0-0) despite Snowden (.902 save percentage and 3.31 goals against average) having the better numbers. Chicago then closes out the regular season with the sixth meeting of the year against Muskegon (40-16-3-1, 84 pts.). The Lumberjacks have won four of the previous five meetings, including a pair of shutouts by goaltender Brandon Bussi. The Steel won the last meeting between the teams, a 6-1 win on February 15 that featured three powerplay goals and a shorthanded strike. Like Central Illinois, Abruzzese has led the way against Muskegon this season with eight points (2-6-8) in five games. Mastrosimone (3-3-6) and defenseman Matteo Pietroniro (2-4-6) each have six points in five matchups with the Lumberjacks. Forward Gunnarwolfe Fontaine (0-2-2) is the only other Steel skater with multiple points against Muskegon this season while seven other Chicago skaters have found the scoresheet once. Muskegon has had 18 different players find the scoresheet against Chicago, including 14 with multiple points. Both forward Bobby Lynch (2-3-5) and Colby Bukes (0-5-5) have registered a point in four of the five meetings while they’re tied with forwards Mikael Hakkarainen (1-4-5), Danil Guschin (1-4-5) and team-leading scorer Egor Afanasyev (2-3-5) for the team lead with five points against Chicago. Robbins has four of the decisions against Muskegon this season, including the lone win as he has accumulated a 1-3-0-0 record, .895 save percentage and 3.89 goals against average. Herbst has appeared in a pair of games with a 0-1-0-0 record, .951 save percentage and 1.52 goals against average with just two goals allowed in four periods of play. Chicago scorers will have to crack Muskegon goaltender Brandon Bussi who leads the USHL with 33 wins this season, third-best save percentage (.915) and fourth-best goals against average (2.44). Bussi has a 4-1-0-0 record against Chicago with a pair of shutouts, .912 save percentage and 2.06 goals against average. Bidding is now available online HERE for the Steel’s End of Season Jersey Auction featuring game-worn black jerseys from the 2018-2019 season. Bidding will conclude at 12:00 p.m. April 15 and is housed online to ensure all fans have the opportunity to bid on a jersey of the future stars of college and NHL hockey. Winners will receive e-mail confirmation at the end of the Steel season with information about when your jersey is available or will be shipped following the conclusion of the team’s playoff run. Steel forward Nick Abruzzese currently leads the USHL with 76 points (27-49-76), three more than any other player. The Harvard University commit would be just the second Chicago player to win the single-season scoring race after forward Andrew Miller did so in 2008-2009 with 82 points. Abruzzese needs six points in the final two games to match the greatest scoring season in franchise history. He is currently third in Steel career points (112) and assists (72) and needs just one assist to match the best single-season mark in franchise history (50). Abruzzese has 18 points in 11 games combined against Central Illinois and Muskegon this season. Steel earn three or more points in this weekend’s games. The Steel earn two points, and YNG and CR each lose one of their remaining games. The Steel earn one point, both YNG and CR earn no more than two points in their remaining games. The Steel lose both games, both YNG and CR earn no more than one point in their remaining games. Chicago Steel Head Coach Greg Moore set a pair of franchise records last Friday night in the team’s 3-1 win over Waterloo. With the win, Moore’s club moved to 35 wins and 74 points giving him the most wins and points by a Steel rookie head coach in team history. The previous records were 34 wins and 72 points, set by Will Nichol during his USHL Coach of the Year 2003-2004 season. Chicago opens the weekend with a matchup against the Central Illinois Flying Aces (24-31-3-2, 53 pts.) on Friday at 7:05 p.m. CT at Fox Valley Ice Arena for Fan Appreciation Night. Forward Trevor Janicke leads the Flying Aces with 47 points (21-26-47) in 56 games, including six points against the Steel and points in four of six games against Chicago this season. Central Illinois goaltender Michell Gibson has appeared in 42 games this season with a 13-20-3-1 record while Ryan Snowden has appeared in 27 games with an 11-11-0-1 record. Snowden holds the better stats with a 3.35 goals against average and .898 save percentage compared to Gibson’s 3.43 goals against average and .893 save percentage. The Steel and Muskegon Lumberjacks (40-16-3-1, 84 pts.) close the regular season with a road game against the Eastern Conference-leading Lumberjacks Saturday night at 6:15 p.m. at L.C. Walker Arena. Forward Egor Afanasyev leads the Lumberjacks with 58 points (25-33-58) in 57 games this season. The Russian forward has five points (2-3-5) in five games against the Steel. Goaltender Brandon Bussi leads the USHL with 33 wins this season as the Western Michigan University commit has a 33-12-3-1 record this season. Bussi’s .915 save percentage is third in the USHL and his 2.44 goals against average is fourth. For more information, call 855-51-STEEL or visit ChicagoSteelHockeyTeam.com.